The USC Innovation Summit is a new event that highlights USC research and innovations to the venture and investment community. 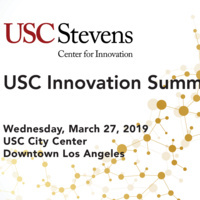 Hosted by the USC Stevens Center for Innovation, the one-day summit focuses on university-owned intellectual property, giving investors exclusive access to USC technologies and discoveries with market potential. The daylong event will feature a pitch competition with USC startups, researcher presentations of exciting new USC technologies, panel presentations, and a keynote address. A detailed agenda will be posted soon.